Raaga.com: “Beauty should not be judged by face value only” – Soulful tale of an acid attack survivor! “Beauty should not be judged by face value only” – Soulful tale of an acid attack survivor! Bollywood has always been preaching that beauty of soul is superior to physical beauty through its movies. Remember movies like Raj Kapoor’s SATYAM SHIVAM SUNDARAM, Rishi Kapoor’s NASEEB APNA APNA or the latest Ayushmann Khurana hit film DUM LAGA KE HAISHA. In each film filmmakers have tried to drive home the point that though the society always discards the ugly and unattractive people but in the end it is these same people who come to their rescue. Thus establishing the fact that one must not be blinded by physical beauty but instead value beauty of soul. However in movies such things may look acceptable but the hard reality is that in ‘Real’ life ugly people, particularly, those disfigured by acid attack or horrible accident have to face stern humiliation and disgrace as the society keeps them at bay as if they are worse than patients of contagious disease!! This results in many people committing suicides unable to face embarrassment and humiliations. However there are a few handful; who do not give up but take life on positive stride and one among them is Reshma Banoo Qureshi, a young girl who is a survivor of acid attack. Reshma Banoo Qureshi, 18, who was brutally dosed with acid on her face by her brother –in-law and his friends has a face that is so scary that it leaves everyone terrified. Besides a burned face her one eye is also damaged making her look more gruesome. Though abandoned by society Reshma continues to fight for her justice. Thanks to media reports many NGO have come forward and raising funds for her treatment. One among them is a beauty channel ‘Blush’ in collaboration with website ‘Make Love Not Scars’, a movement that brings awareness about acid attack survivors and showcases the talents and strengths of acid attack victims. 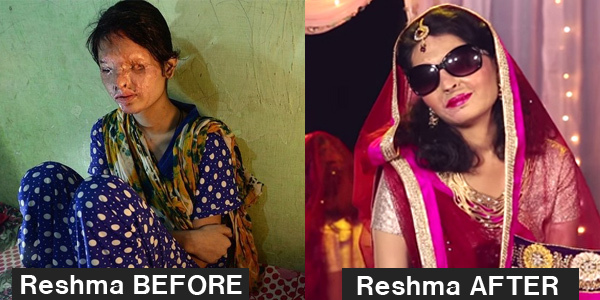 The beauty channel has issued a video in which the beauty experts are seen giving makeover to Reshma. Sequel of Aamir Khan’s 3 IDIOTS on its way!